It turns out that counting to ten before responding in anger, or any emotion, has scientific validity. The Amygdala part of the brain, is the integrative center for emotions, emotional behavior, and motivation. It reacts to triggers before the frontal lobe of the cerebral cortex part of the brain, responsible for reasoning, kicks in, which may take 10 seconds. Therefore, counting to ten gives you time to respond rather than react to a stimulus. 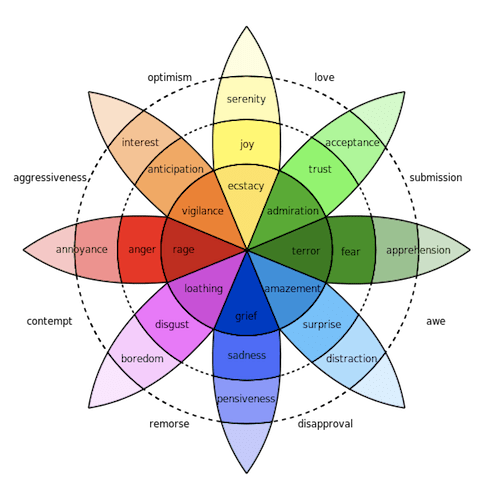 Robert Plutchik created the wheel of emotions in order to illustrate the various relationships among the emotions. The intensity of emotion decreases as you move outward and increases as you move toward the wheel’s center. The intensity of the emotion is indicated by the color. The darker the shade, the more intense the emotion, therefore, anger at its least level of intensity is annoyance, but at its highest, anger becomes rage. The next time you are tempted to hurl sticks and stones, count to ten–save your blood pressure, a friendship and possibly a marriage.